Ghana goment den China sign $2 billion bauxite deal plus Sinohydro Group Limited which go bring infrastructure like roads, railways, bridges, hospitals, rural electrification den tins for di country. President Akufo Addo den China President Xi Jinping for Beijing sign eight Cooperative Agreements den MoUs for Beijing on Sunday. Dis barter trade deal dey mean say Chinese company Sinohydro Group go carry refined bauxite from Ghana, while di country go benefit from major construction to di tune of $2 billion to boost development. 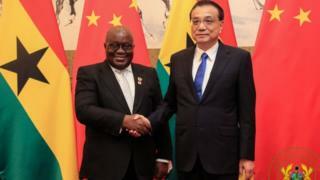 Image example President Akufo Addo tok say "I finally finish di barter trade deal agreement plus President Xi during wana meeting" wen e speak to Ghanaians who dey live inside China. But President Akufo Addo explain say dem put for di deal inside say di raw materials for be processed before dem go export am from Ghana. Chinese Yuan beta pass American Dollar? Meanwhile, Global financial analyst Fitch predict for dema 28th August, 2018 report inside predict say Ghana go fit face some risks from di $2 billion bauxite deal if di value of di bauxite start dey drop. But government say di barter trade agreement no go add to Ghana en debt burden.